When the Minneapolis Auto Show opens next week, the new Mitsubishi 311RS Evo X will bring a new level of import performance to the US market with this limited edition, track tuned sort compact sedan. The new Mitsubishi 311RS Evo X is a heavily modified version of the popular Lancer Evolution X that was designed by pro racer Ryan Gates, who spent three years picking the ideal components and tuning everything to work together to create what he believes is the ultimate combination of track and street capabilities. The 311RS Evo X has been shown off on the company website for months now but on March 11th, the high performance Evo X will debut at the Minneapolis Auto Show. The heart of the Mitsubishi 311RS Evo X is the same 2.0L dual overhead cam engine that is in the standard 2013 Evo X but Gates and his team have made a handful of changes that add a whole bunch of extra power. The high performance Evo experts at AMS Performance (who happen to sponsor Gates) have been tapped for this build, adding an intake setup, a large front mount intercooler, a larger downpipe, a high flowing catalytic converter, a high performance exhaust system and a custom engine calibration tune to substantially increase the output of the Evo’s 2.0 mill. Thanks to the AMS high performance items, the 311RS Evo X offers 353.1 horsepower and 358.6lb-ft of torque at the wheels – numbers which the company states are 120.8hp and 96.2tq more than the stock Evo as tested. 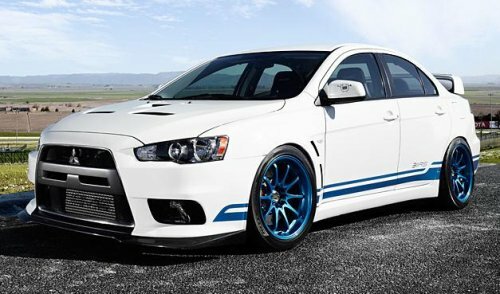 The standard Mitsubishi Evo X makes 291 horsepower and 300lb-ft of torque at the crankshaft but in searching some of the largest Evo forums online, it looks like these cars make roughly 230-250 horsepower at the wheels. In terms of horsepower "at the crank", the 311RS Evo X offers 420 horsepower and 420lb-ft of torque...amounting to an increase in raw horsepower of almost 45% compared to the stock, standard Evo X. Once the engine output was where Gates wanted it, he took to improving the handling capacities of the Mitsubishi 311RS Evo X. The suspension system is provided by JRS, with the adjustable coilover setup mated to a set of JRS top mounts; all tuned and optimized specifically for the 311RS. Helping the 311RS Evo X stop on a dime, Gates and his team have added Girodisc 2 piece slotted brake rotors, Girodisc brake pads designed specifically for the 311RS, Girodisc stainless brake fluid lines and Girodisc brake caliper heat shields – all of which help this Evo stop better and continue doing so over an extended period of time. In short, this is a braking and suspension system that is designed for the track but has adjustability to also offer a comfortable ride on the street. Finally, Volk lightweight 18 inch wheels wrapped in Nitto NT05 tires cap off the performance modifications made to the 311RS. In terms of appearance, the Mitsubishi 311RS Evo X features a unique front chin spoiler from JDP, a large Voltex rear spoiler, the sharp looking blue race livery and those gorgeous blue Volk wheels. Inside, the 311RS wears a unique Etnies E-Suede upholstery that should help keep the occupants safely in place while also being more durable than “normal” suede seats. The good news is that the Mitsubishi 311RS Evo X will carry an MSRP of just $49,000. While that is a healthy step up over the base price of the standard Evo X of around $36,000, when you consider all of the performance parts and tuning efforts that went into the project – this really isn’t a huge price tag for this track tuned Evo. The bad news is that only 11 units will be built and with a price of $49,000, we would expect that all 11 will be sold in a big hurry. On top of the simple fact that there has been so much added on the inside and outside of the 311RS, this car has undergone intensive testing and tuning at the hands of a guy who makes a living going really, really fast in an Evo. You might be thinking that the Minneapolis Auto Show is an odd location for the Mitsubishi 311RS Evo X to debut and honestly – it is. Some might argue that a show like Los Angeles, New York or Detroit would have been the far better venue in which to publically unveil the production version of the 311RS but considering that Ryan Gates resides in the Minneapolis area, the car will debut in its designer’s back yard. This might not be the best venue for the 311RS Evo X to receive gobs of interest but with so few units available – we are pretty sure that the company wont have a hard time selling them all in a big hurry no matter where it debuts. Image by Nate Hassler via 311rs.com. Click here to view the company site with more images of the aggressive 311RS Evo X.